Big Red Car here. Gray and gloomy, bit cool maybe, here in the ATX. Well, it’s Tax Day and that can put a bit of gloom on everything. Speaking of taxes, said the Big Red Car with a smile, makes me think about building the financial talent in a startup or small company. The big lesson is this — do it slowly, smoothly and with a bit of cleverness and don’t just leap out and anoint someone the Chief Financial Officer. Building the financial talent you need in a startup or small company is a gradual process but one that starts at the very beginning. The big lesson today — it is a gradual process that begins at the beginning. 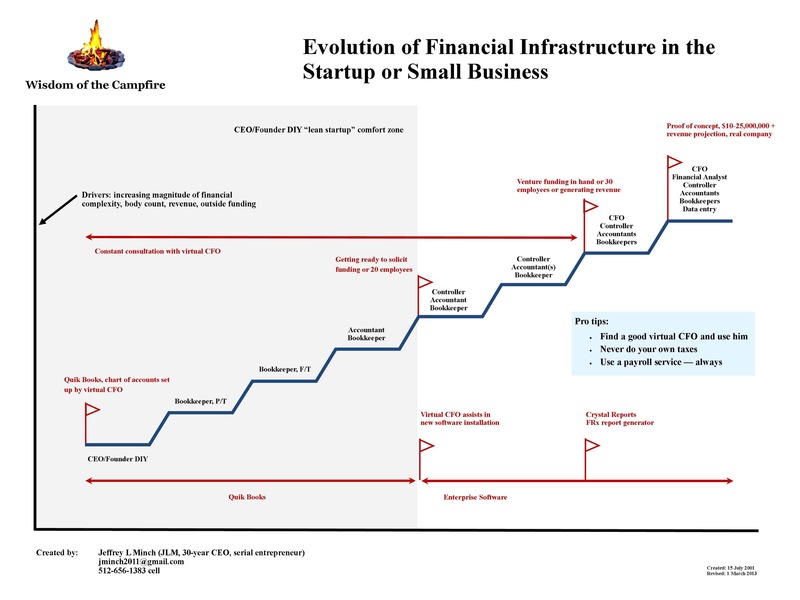 Look at this iterative graphic which shows an idealized methodology in which financial talent is added — as needed — to your enterprise as you get it out of the cradle and teach it to crawl, walk, run. Click on the graphic to see it in a larger size. Crawl, walk, run is a good paradigm for any developmental activity. You get bigger and you get better and you grow your organization to meet the growing challenges. You grow into your capabilities. Financial talent is one of the most basic skills that any business must embrace to be successful. And it is one of the most universally common talents by which I mean the setting up of a chart of accounts is almost universally the same for any type of business so it is not necessary for a CPA to also be a software engineer to be able to set up the right chart of accounts for a web product development company. Because of this it is possible to use different levels of talent in bite sized pieces to provide different levels of support as the startup or small company grows. This is an evolutionary process. Take a look at the graphic and see how it is possible to use a part time bookkeeper or a virtual Chief Financial Officer to provide critical support as the enterprise grows. The entrepreneur needs to plan for this evolution and the above graphic shows a methodology that can be adapted to almost any situation. Use short term and temporary solutions to grow your financial capabilities as your business grows. When the time comes that it is essential to build permanent and solid financial infrastructure, you also want to crawl, walk, run. Build from the bottom up. Hire a part time bookkeeper and then a full time bookkeeper — the Chief Financial Officer is not your first financial hire. You can still rely upon the virtual Chief Financial Officer to shepherd even your fledgling permanent staff. Be clever about adding talent. There are certain milestones that mandate careful attention and consideration from the founder or entrepreneur. 1. When you are ready to solicit serious funding — not friends and family, maybe not even angels — from a venture capitalist. This might be viewed as a Series A funding. 2. When you have a total body count of twenty employees. This is a complementary sign and is a proxy for growth. 3. When you have received venture funding — those VCs are going to expect a level of regular financial reporting which is a bit more than you need internally. 4. When you get to thirty total employees. 5. When you have proof of concept or product-market fit and are now focused on scaling the enterprise. Here you are growing in anticipation of a heightened growth rate. 6. When the company has any multiple of $10,000,000 in revenue — not earnings, revenue. What is important is not what specific milestones you use but rather that you do, in fact, anticipate some discreet signals which will necessitate action. The Boss is very fond of saying that you should hire the next level of financial talent before you really need it. This is a good strategy if you can afford it. If you cannot afford it, then keep it in mind for when you can. Far be it from the Big Red Car to ever disagree with The Boss — hey, I know who’s filling my tank, ya’ll — but this is an area of delicate consideration. Get that Chief Financial Officer when you only really need a Controller? As part of the evolution of your company — read growth — you will also need to give careful consideration to the infrastructure for producing the financial information that is the work product of your financial and accounting talent. 2. Buy good software. Get recommendations from your consulting virtual CFO on this. There comes a time when Quik Books is not good enough and you will need an enterprise piece of software. That may be very far into the future as Quik Books is good and getting better. 3. You will also need to consider things like Crystal Reports and FRx — which are both essentially report writers. 4. The nature of your business may be such that you will need both financial accounting and management accounting. If that is the case and you need to integrate your performance with your finances careful consideration must be given as to how this will take place and what management information you will mine to create this capability. This is an area in which small companies often stub their toes. Be careful to document everything that you do from your initial chart of accounts to your revenue recognition policies to your depreciation schedule to your tax assumptions. Never, ever file your own state or Federal income taxes. Always use an outside firm and try to get them to do it for a fixed fee. Have it all reviewed by your virtual CFO. Never, ever do your own payroll. OK, as you get very big sure you can do your own payroll but initially let someone else like a payroll service do it. Keep exquisite financial files and understand your obligations to maintain files of all kinds. Keep manual and digital files on site and off site. Destroy files as soon as you have no obligation to maintain them. The most important consideration is to be thoughtful and have a good plan to grow the financial capabilities of your company. Have a plan. Obtain and use as much advice as you possibly can absorb and do not fail to heed this important consideration. You do not have to build more infrastructure than you need until you need it. This entry was posted in Business, Startups and tagged building a company, developing financial talent, financial talent. Bookmark the permalink.